Adventure Club - To the North Pole during the polar night! TO THE NORTH POLE IN THE DARKNESS OF THE POLAR NIGHT! Two Russian explorers became the first men in history to ski to the North Pole in the interminable darkness of a polar winter. Matvey Shparo and Boris Smolin had overcome more than 1000 km in 84 days from the Arktichesky Cape (Severnaya Zemlaya Archipelago) to the North Pole. The Expedition started on December 22, 2007 (the day of winter solstice) and was completed on March 14, 2008 before the first sun rise. For the first time the North Pole was conquered by the American explorers on dog sleds in April 1908, one hundred years ago. The modern technologies and the level of knowledge about the nature of the high latitudes provide possibility to establish a basically new record – to conquer the North Pole by ski during the polar night, characterized by low temperatures and complete darkness. Experts in polar science consider that this Expedition had also achieved many practical and scientific results, as during its realization there were used both human recourses and modern technologies: ice reconnaissance with the help of the radar satellite photographs for choosing a correct route; overcoming open water areas in special survival suits; usage of special lanterns and power sources, which allowed the explorers to travel and work in the conditions of twenty-four hour darkness and low temperatures (up to -55°C). Vladimir Putin, President of Russia, congratulated Matvey Shparo and Boris Smolin on their victory in his greeting telegram. Matvey Shparo (32, Moscow) and Boris Smolin (46, Moscow) are far-famed as the organizers and participants of many successful national Arctic Expeditions: a ski crossing of Greenland and an ascent to Mt. McKinley, Alaska. In both cases the teams of the Expeditions included the participants with spinal code injury. 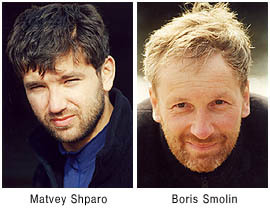 Matvey Shparo and Boris Smolin were awarded with the Orders of Friendship for their crossing of Greenland. Matvey Shparo had the diploma of the Guinness Book of World Records for the ski crossing of the Bering Strait (1998, together with Dmitry Shparo). The preparation of the Expedition consisted of several stages. In December 2005 the participants of the Expedition carried out a training trip in the region of Norilsk. December 2006 – the next training in Greenland. In spring 2007 Matvey Shparo and Boris Smolin in order to practice the techniques of traveling over drifting ice, traveled by ski along the most dynamic Arctic regions: across the Longa Strait from the Wrangler Island to the coast of the continent (Chukotka). Please, reach YouTube for video plots from the landing point and the first meters of the Expedition of Matvey Shparo and Boris Smolin at the Arktichesky Cape. Training in the Longa Strait, spring 2007.